Last weekend Jake wanted to take me to Salazar’s, a Mexican restaurant in Downtown. He had gone recently and really liked it. But when we drove by we discovered that Salazar’s had closed! The last day was the week prior. The lot was sold to make way for new construction. Instead we decided to finally try Pokez, a place we had passed so many times but had never visited before. 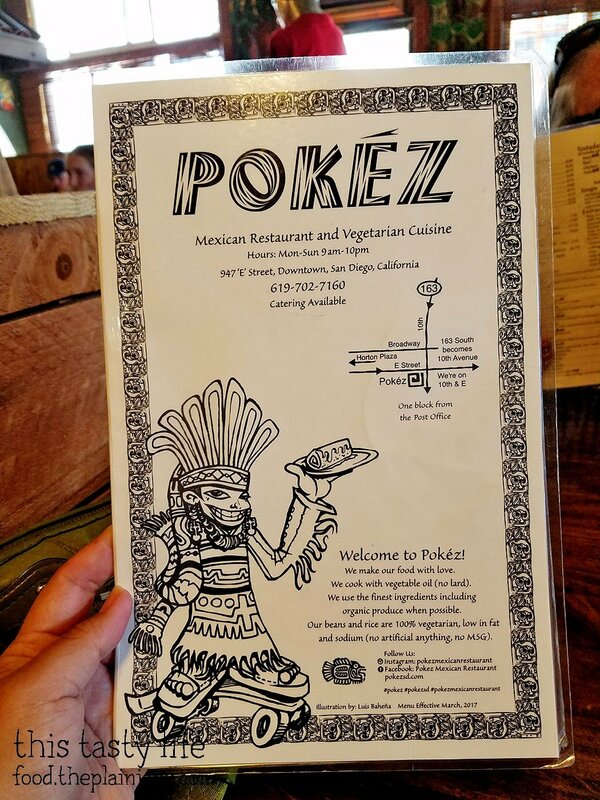 If you’re come into Downtown from the 163, you’ve likely passed Pokez on the corner of 10th & E.
Pokez is known as a vegetarian restaurant… BUT they also serve the meats! 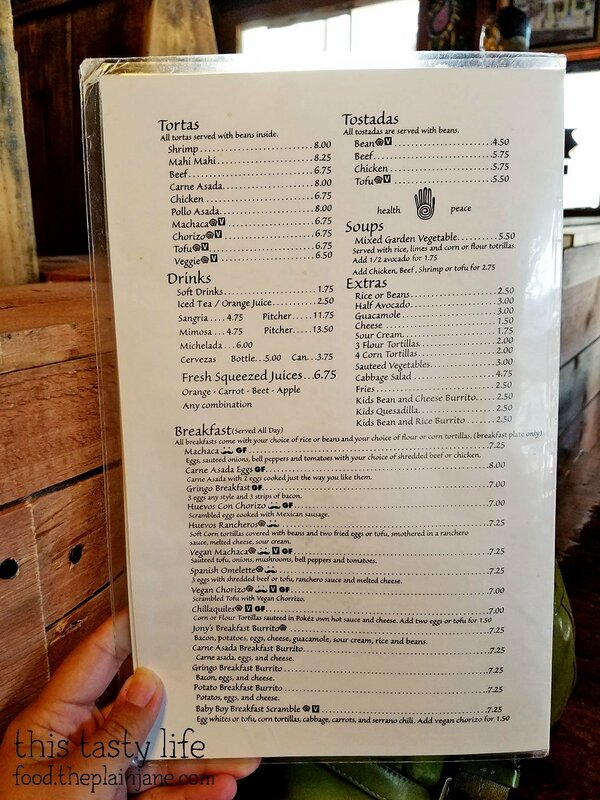 All of the menu items can be served the way you want them – with whatever kind of meat you want, or with tofu! 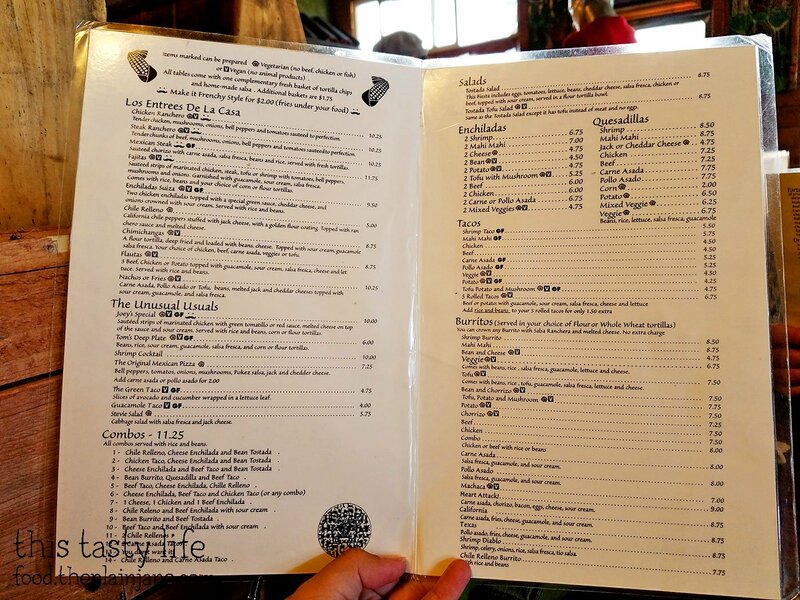 Menu items are marked for vegetarian, vegan, and gluten free so you can make easy menu choices. We were given a complimentary basket of Chips and Salsa. If you want a refill on chips, it’s $1.75 a basket. Kind of a steep price for a refill if you ask me. 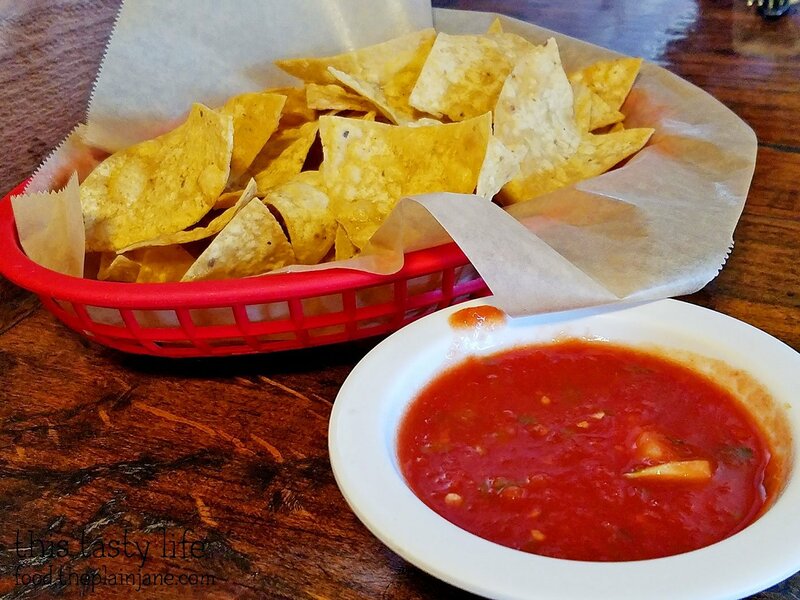 The salsa had a nice flavor to it. Nice mixture of herbs and spices in the salsa. Chips were decent, just needed more salt. Jake’s mom got a plate of Chicken Flautas [$8.75]. 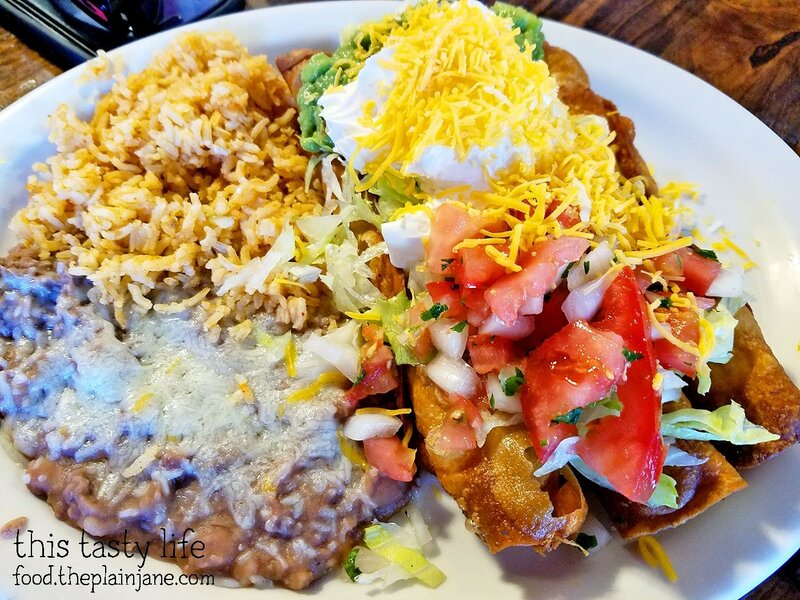 The flautas looked like they were freshly made and topped with a nice mix of tomatoes, onions, cilantro, lettuce, sour cream, guacamole, and cheese. I had a little bite of a flauta and it tasted quite good. They were crunchy and the chicken filling was moist and tasty. Jake got the California Burrito [$8.75] and he got it “wet” with ranchero sauce and cheese melted on top of the burrito. The carne asada inside the burrito had an incredible amount of flavor and was super tender. I actually really liked the ranchero sauce on top as well mixed with all of the melted cheese. I thought Jake’s dish was the winner of the meal that day. I decided to get a combo and ordered the #3 Combination with Beef Taco, Cheese Enchilada and Bean Tostada [$11.25]. The beef taco was very disappointing. The taco shell tasted old and stale – clearly not made fresh. The filling was also lackluster as the ground beef didn’t have a ton of flavor. The cheese enchilada was my favorite of the three items I got. The enchilada sauce was delicious and the melted cheese inside and out made them tasty. I didn’t really care much for the beans which lacked flavor to me – probably because they’re vegetarian? At least, that’s my guess. The rice was okay. 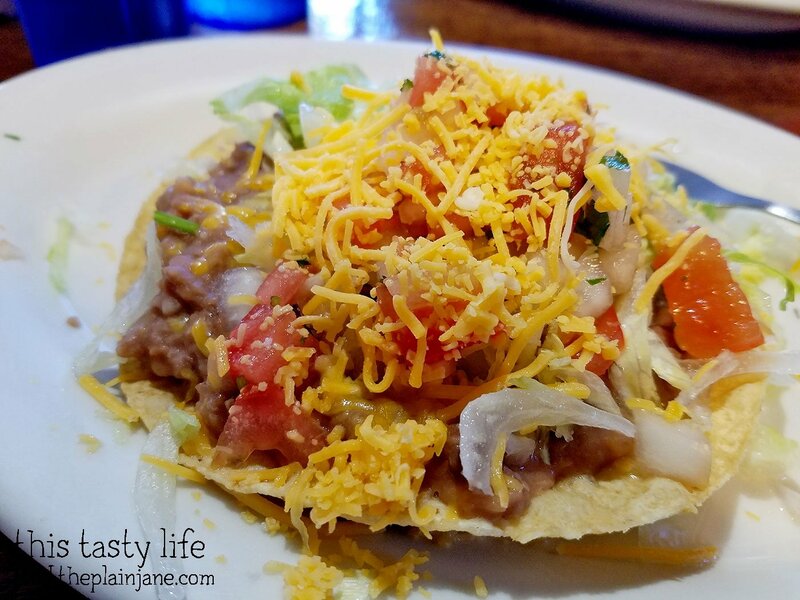 For the bean tostada, the shell had the same problem as the taco shell – it tasted old, stale, and got very soggy. I can excuse the sogginess since it’s got beans and toppings on it, but the stale, bland taste was a turnoff for me. 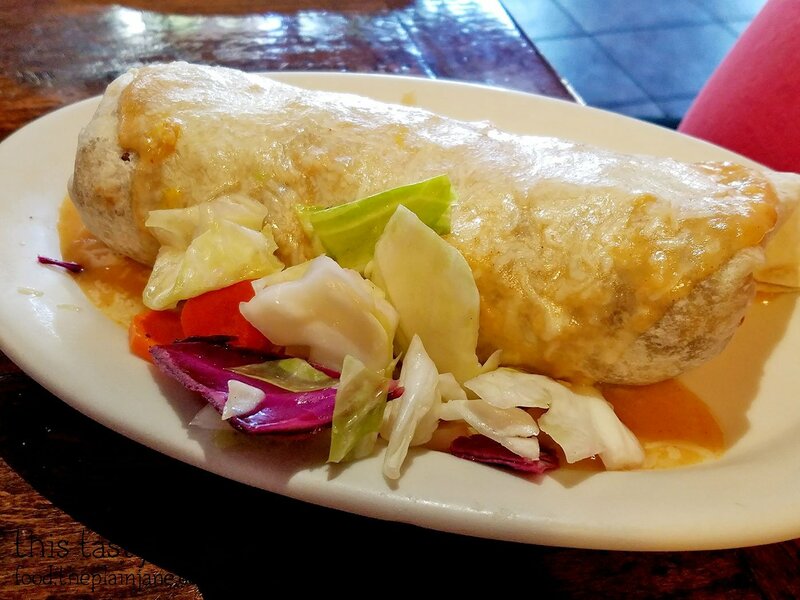 The lesson I learned is to go for burritos or enchiladas at Pokez. 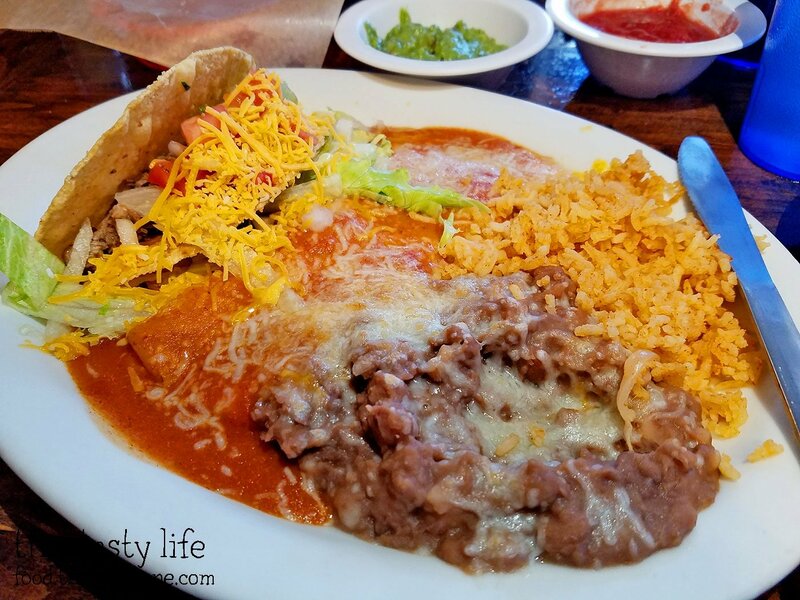 Those dishes are much better than anything that requires a shell like the taco or tostada. I”ve always wondered about this place. I thought it was only all vegetarian. Good to know that there are meat options. Hi CC – I thought that, too! Good to know you can order it however you want it at Pokez. Hi Amy! Thanks for stopping by! Hope you check it out!